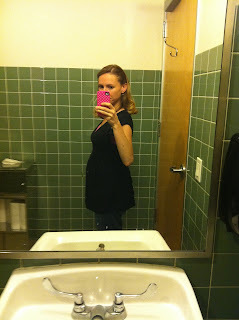 I am now 20 weeks pregnant – which means I’m half way through my pregnancy! It’s all downhill from here, right? :)(jk) According to “What to Expect” my baby is now the size of a melon. I’ve gained 8 pounds so far and am now the heaviest I have ever been, and it’s only going up from here. I won’t tell you my actual weight bc, frankly, it’s none of your business, and besides you all know I started out super small. Please forgive the cheesy bathroom photo. This was one of the first times that I caught myself in the mirror and thought “Wow! 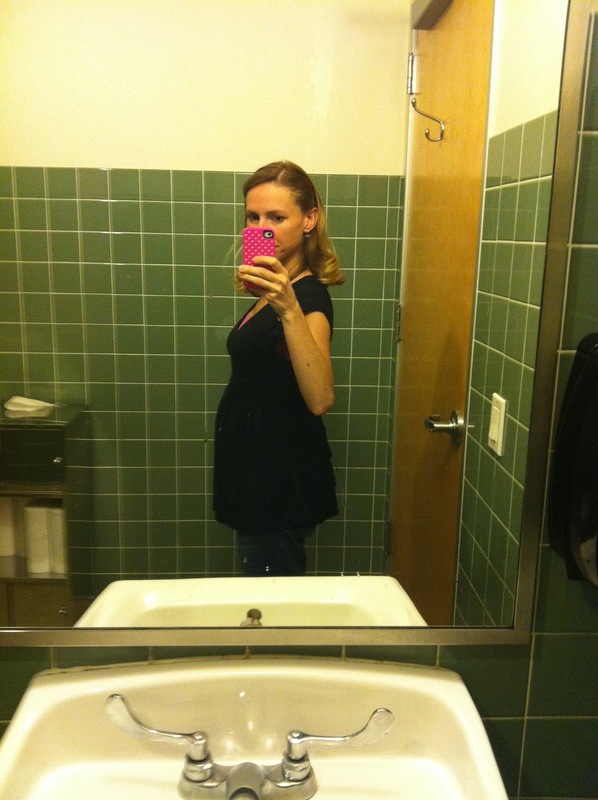 I look pregnant!” It’s so weird looking down and seeing my belly protruding! The funny thing is that I really feel like the bump has “popped” in just the past couple days. Weekend before last (when I was 19 weeks), some friends and I went around the city and did an urban ballerina style photo shoot. It was so much fun! And I was able to hide the small bump I had that weekend under my warm up outfit. I also went to a friend's kid's birthday party and a lot of the moms there said, "You're 19 weeks?! You don't look it at all!" So it's kind of nice now, just a week later to be able to look in the mirror and actually see a bump. The baby has definitely started kicking. In fact, as I sit here typing, I can feel it (her?) tapping away on my insides. J It’s still too unpredictable and light for Aaron to be able to feel from the outside. Lately our evenings will consist of us sitting on the couch watching tv and I’ll feel it kick and then he’ll put his hand on my belly. And then we wait and wait and wait, so he finally moves his hand and then it’ll kick again 10 minutes later. Hopefully someday soon, Aaron will have his hand on my belly at the right time and be able to feel it. Yes - you look pregnant! You definitely look pregnant now!!! So adorable! Aaron will be feeling her in no time. 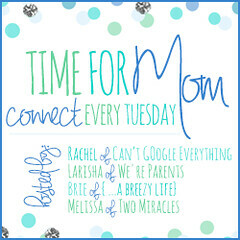 First pregnancies are so magical because you have nothing but time to truly enjoy all of the minute aspects of the experience. Try and relish it as much as possible because it will be over quickly.